and tacos for the Holiday. 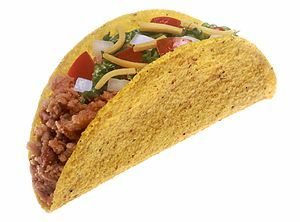 This subject got all of us talking about the origin of the word “taco.” So, once again I went to Wikipedia and Ask.com. The taco has a very interesting history. A taco ( /ˈtɑːkoʊ/) is a traditional Mexican dish composed of a corn or wheat tortilla folded or rolled around a filling. A taco can be made with a variety of fillings, including beef, chicken, seafood, vegetables and cheese, allowing for great versatility and variety. A taco is generally eaten without utensils and is often accompanied by garnishes such as salsa, avocado or guacamole, cilantro, tomatoes, onions and lettuce. The taco predates the arrival of Europeans in Mexico. There is anthropological evidence that the indigenous people living in the lake region of the Valley of Mexico traditionally ate tacos filled with small fish. Writing at the time of the Spanish conquistadors, Bernal Díaz del Castillo documented the first taco feast enjoyed by Europeans, a meal which Hernán Cortés arranged for his captains in Coyoacán. It is not clear why the Spanish used their word, “taco”, to describe this indigenous food. About Catholicism: When Is a Friday Not a Friday? Today, Catholics around the world, just like most non-Catholics and non-Christians, will count down the final hours of 2011 and welcome the New Year. But a few hours later, while others are sleeping in, we’ll be at Mass celebrating the first major feast of 2012: the Solemnity of Mary, Mother of God. What better way to ring in the New Year than to celebrate the woman whose complete devotion to God played such a central role in our salvation? Best wishes, on behalf of my family and myself, for a happy, healthy, and prosperous New Year! Abstinence from meat, or from some other food as determined by the Episcopal Conference, is to be observed on all Fridays, unless a solemnity should fall on a Friday. Solemnities are the highest feasts of the Church, the days that, under normal circumstances, are considered Holy Days of Obligation (though not every country observes all of them). So, in recent years, when both the Solemnity of Saint Joseph and the Solemnity of the Annunciation fell on Fridays, there was no obligation to abstain from meat (or practice an alternative penance) on those days. And Christmas, of course, is a solemnity as well. But what does any of this have to do with the Second through Eighth Days of Christmas? Here’s where things get really interesting. Historically, the Catholic Church has observed octaves of important feasts. Before the reform of the liturgical calendar in 1969, a considerable number of feasts (very roughly, those that we now consider solemnities) had octaves attached to them. An octave (an English abbreviation of the Latin octava dies, or “eighth day”) comprises the seven days following a feast, and the feast itself. The Church treats every day during the octave of a feast as if it were the feast itself. So, for instance, the prayers for Mass and the Liturgy of the Hours (the Church’s daily prayer) during the Octave of Christmas refer to each day as if it were still Christmas Day. And, liturgically speaking, it still is. Liturgy, by its very nature, takes us outside the bounds of time. At any of the Church’s liturgies, we are standing before the throne of God in Heaven, where time does not exist. So an octave is a way to extend a feast day for a full eight days. Twenty-four hours, the Church is saying, just simply isn’t enough time to rejoice in Christ’s birth; we need more. So what does this mean concerning our Friday penance? Well, if Christmas falls on a Friday, not only are we not required to observe abstinence (or some other form of penance), we shouldn’t abstain. There is a time to fast, and a time to feast, and feasts such as Christmas are not times to fast. So, if you’re still chipping away at the remains of your Christmas goose or roast, or if you’d just like a nice juicy steak or hamburger today, go ahead—it’s still Christmas! Can You Eat Meat on the Annunciation? Bible History Daily is a publication of the Biblical Archaeology Society.Catch up on the week’s articles from Bible History Daily. At the edge of the Western Wall plaza in Jerusalem, archaeology is revealing layers of the ancient city, including the eastern Jerusalem cardo from Aelia Capitolina of the Roman period. Eilat Mazar’s new book chronicles her career from its beginnings to her recent discovery of King Solomon‘s wall at the Ophel in Jerusalem, near the City of David. This January 13-15 at the ASOR/BAS Seminar on Biblical Archaeology in Orlando, Florida, ASOR’s Andrew Vaughn will present the archaeological data for Iron Age Jerusalem, which the Bible describes as the neutral capital of David and Solomon’s United Monarchy. In our free eBook Ten Top Biblical Archaeology Discoveries, Jane Cahill West describes the archaeological evidence for early Jerusalem, including the monumental Stepped-Stone Structure, the largest Iron Age structure ever discovered in Israel. Archaeologists with the Israel Antiquities Authority have discovered a large, well-preserved Byzantine-era bathhouse in the Judean foothills about 20 miles west of Jerusalem. A new, user-friendly index to the Talmud known as HaMafteach allows readers to easily search the wide-ranging content of the massive sixth-century collection of rabbinic thought. Get a free trial issue of Biblical Archaeology Review magazine. Here I go again. Thoughts of the New Year bring reminders that it’s time for resolutions. I will be dieting, together along with exercise. My exercise of preference is yoga. Here is a word that has come into the English language as a “borrowing” from the Hindu. It is a word often used in the practice of yoga. Enjoy! noun a conventional Hindu expression on meeting or parting, used by the speaker usually while holding the palms together vertically in front of the bosom. “namaste.” Dictionary.com Unabridged. Random House, Inc. 29 Dec. 2011. <Dictionary.com http://dictionary.reference.com/browse/namaste>. Spotters have reported record numbers early in the whale-watching season, delighting tourists, boaters and divers. The marvelous perfection of creation, where everything fits and works together to bring about God’s plan, should help us keep God always in mind, says St. Basil. If we remain ever aware of the beauty of God’s creation, we’ll give sin no opportunities. “And God saw that it was good.” God does not judge the beauty of his work by the charm of the eyes, and he does not form the same idea of beauty that we form. What he finds beautiful is what, in its perfection, shows all the fitness of art, and what works toward the usefulness of its purpose. So God, who planned an obvious design in his works, approved each one of them, because it fulfilled the purpose for which it was created. A hand, an eye, or any part of a statue lying apart from the rest, would look beautiful to no one. But if each part is restored to its own place, the beauty of proportion, until now almost unperceived, would strike even the most uneducated. But the artist, before uniting the parts of his work, distinguishes and recognizes the beauty of each of them, thinking of the purpose that he has in view. This is how Scripture depicts to us the Supreme Artist, praising each one of His works. Thus earth, air, sky, water, day, night, all visible things, remind us of our Benefactor. We shall not therefore give occasion to sin, we shall not give any room to the Enemy within us, if by constant recollection we keep God ever dwelling in our hearts. BIBLE HISTORY DAILY IS A PUBLICATION OF THE BIBLICAL ARCHAEOLOGY SOCIETY. Catch up on the week’s articles from Bible History Daily. December 24, 2011 Send to a Friend | Subscribe to RSS | Trouble viewing this email? Click here to view in browser. Were the Magi’s Gifts Tribute or Treatment? The gifts of the magi–gold, frankincense and myrrh–may have had symbolic as well as practical value. Researchers believe the medicinal uses of frankincense were known to the author of Matthew’s gospel. In our best-selling DVD documentary Where Jesus Walked, you’ll travel with BAR editor Hershel Shanks as he visits Nazareth, Galilee, Capernaum, Bethsaida, Qumran, Sepphoris and Jerusalem to view important sites from the time of Jesus. Jesus may be one of the best known and most talked-about people of ancient history. But do scholars know anything about what Jesus actually looked like? This January 13-15 at the ASOR/BAS Seminar on Biblical Archaeology, renowned New Testament archaeologist James Strange will reveal new archaeological discoveries in Jerusalem and the Galilee that are changing the way we understand Jesus’ life and times. In our free eBook The First Christmas: The Story of Jesus’ Birth in History and Tradition, you’ll read fascinating articles by expert Bible scholars that offer glimpses of the first Christmas as recounted and understood by those who first told the beloved story. Archaeologists working in Saudi Arabia continue to puzzle over the meaning of more than 50 groups of oddly arranged standing stones, the most famous of which are found at the site of al-Rajajil. Archaeologists excavating an ancient sanctuary on the small, central Mediterranean island of Malta have discovered an agate stone inscribed with 13th-century B.C.E. cuneiform script. As violent clashes erupted in Cairo this week, a 213-year-old library was set ablaze, destroying thousands of rare maps and books, including an original copy of the famousDescription de l’Egypte. Frankincense, the fragrant and aromatic resin that was one of the three famous gifts of the magi in the traditional Christmas story, could soon be no more. Get a free trial issue of Biblical Archaeology Reviewmagazine. God speaks to us through Scripture and the Church. But God also speaks to us through our reason, says St. Augustine. The truth is God speaking to us, not through our ears, but through our minds. It is a great thing for a man, and a very rare one, after contemplating the whole creation, corporeal and incorporeal, and seeing how changeable it is, to pass beyond it, to reach to the unchangeable being of God, and—in that peak of contemplation—to learn from God himself that no one but God has made everything outside God. God speaks with us, not by means of some some audible creature making a sound, so that vibrations of the air connect the one who speaks with the one who hears. Nor does he even speak by means of a spiritual being with the appearance of a body, such as we see in dreams or similar states—for even in that case, God is speaking as if to our bodily ears, because he is speaking by means of the appearance of a body, and with the appearance of a real space between him and us, visions being exact representations of real things. No, God does not speak by these things, but by the truth itself—if anyone is prepared to hear with the mind rather than with the body. For he speaks to that part of us that is better than everything else in us. Only God, in fact, is better than that part of us. St. John Cassian remembers how the wise old abbot Moses told him to see God everywhere. If you approach with a pure heart, the world around you will show you His face. We certainly do discover God by admiring his incomprehensible essence, which still lies hidden in the hope of the promise. But we also see him through the greatness of his creation, and the consideration of his justice, and the help of his daily providence. We see him when with pure minds we contemplate what he has done with his saints in every generation, when with trembling heart we admire his power, with which he governs, directs, and rules all things, or the vastness of his knowledge, and that eye of his from which no secrets of the heart can lie hidden. We see him when we consider the sand of the sea, and the number of the waves measured by him and known to him, when in our wonder we think that the drops of rain, the days and hours of the ages, and all things past and future are present to his knowledge; when we gaze in unbounded admiration on that ineffable mercy of his, which with unwearied patience endures countless sins that are every moment being committed under his very eyes. We see God in the numberless opportunities of salvation he grants to those whom he is going to adopt. We see him in the way he made us be born so that from our very cradles his grace and the knowledge of his law might be given to us. Finally, we see him in the way he undertook the dispensation of his Incarnation for our salvation, and extended the marvels of his sacraments to all nations. But there are numberless other considerations of this sort, which arise in our minds according to the character of our life and the purity of our heart, by which God is either seen by pure eyes or embraced. No matter what scientific explanation you come up with for the origin of the universe, says St. Basil, you’ll go far wrong if you don’t put God at the beginning of it. I stop struck with admiration at this thought. What shall I say first? Shall I demonstrate the vanity of the Gentiles? Shall I praise the truth of our faith? The philosophers of Greece have tried very hard to explain nature, and not one of their systems has remained firm and unshaken. They are enough in themselves to destroy one another. Those who were too ignorant to rise to a knowledge of God could not allow that an intelligent cause presided at the birth of the universe—a primary error that trapped them in sad consequences. Some fell back on material principles and attributed the origin of the universe to the elements of the world. Others imagined that atoms, and invisible bodies, molecules and tubes, unite to form the nature of the visible world. It is because they did not know how to say, “In the beginning God created the heaven and the earth.” Fooled by their inherent atheism, they thought that nothing governed or ruled the universe, and that everything was given up to chance.